Praveen from Delhi, B.Sc Graduate. WRITER JOURNALISM AND MASS .. COPY AND CREATIVE WR.. EDITING & PROOFREADI..
are one of expert skill area's of Praveen . 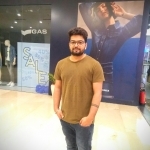 Praveen is working in Content Editors industry.